Answer: Naturally! You grow a man out of yourself! What for, why, how? You do not do it in order to spend a nice evening, to enjoy something, and after that, it does not matter because the main thing is to feel good now. Not at all! Kabbalah discovers where the truth is. For its sake, I am ready to sacrifice my present pleasure at every minute and go against it. This is my struggle. I always weigh what is more important to me: truth or pleasure? And then, I set the screen over my desire and act in the name of bestowal. Working against pleasure, I suddenly begin to feel that there is 620 times more pleasure in bestowal than in reception. Question: Does a person have the ability to control his desires, to make such calculations? Answer: Everything is done by the upper Light! We do not need to be sophisticated. The only thing is not to be shy but to try to implement everything in the group correctly and consistently. The group is the biggest obstacle. A person does not want to get close to others. He cannot imagine that this is what will give him such stunning results. Of course, there are people who are ready to connect, but for them this is earthly connection. Spiritual connection is practically difficult for everyone. Therefore, nothing is more, less, better, or worse. Everyone has to go through this stage where by clenching their teeth, they work in a group, try to get included in it, do something, and do not shy away from group activities. It is their effort in spite of their desire that gradually gives results. Question: Is there disinterested friendship? If yes, in what equality and dependency of attitudes? Answer: There is nothing selfless in the corporeal world because everything is based on egoism; it is the basis of our nature. Therefore, there is no need to have our heads in the clouds. Nature is entirely arranged only on the egoistic principle—the desire to enjoy. But the fact is that with the help of the upper Light, that is, the influence of the Creator, we can rise above our nature and begin to use it differently—for the benefit of others. We as if rise above the Earth, overcome its gravity, but only with the help of the upper Light. Days after the deadly earthquake measuring 7.5 on the Richter scale struck the island of Sulawesi in Indonesia, and the huge tsunami destroyed large parts of it, the dimensions of the disaster are becoming increasingly clear. Roughly 1,300 people have been killed so far from this disaster, and the death toll could reach thousands. It seems that the higher the death toll, the greater the indifference in the world. 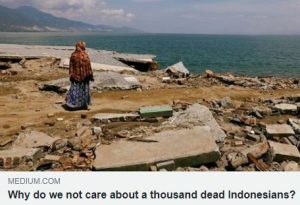 Just to refresh our memory, the earthquake that struck Indonesia in 2004 and the subsequent tsunamis took 230,000 victims. The entire world was mobilized for help, but the current disaster is hardly arousing much sympathy in the world beyond the typical headlines. Hurricane Florence, which hit the South Carolina coast two weeks ago and took a total of six victims, received ongoing media coverage on an international scale. Alongside the destroyed roads in Indonesia are signs reading “we need food” and “we need help.” International rescue teams find it difficult to operate without proper equipment, tens of thousands of injured residents are in need of treatment. Hundreds of thousands have lost their homes, and in whole areas, hundreds of people are still trapped under collapsed structures. Their voices have gone silent and the rescue forces may never reach them. The world, which only a month ago was nervously following a nerve-racking rescue of a group of boys outside a cave in northern Thailand, prefers to be occupied with Trump’s and Percy’s speeches. It’ll be a mistake to think that Indonesia’s influence somewhere in Southeast Asia is remote. We live in an integrated global world, and the various disasters that have plagued us in recent decades illustrate the interdependence that characterizes the global system we live in. On face value, nations associate themselves with international organizations whose declared goal is the general good, but in practice, they merely advance their own private interests. The World Trade Organization, NATO, the Organization of the Islamic Conference (G8), the OECD, the UN, the EU and even the Internet — are just a few examples of the networks we have created, and yet, it’s all mostly for show. We lack the awareness that we’re all sailing stormy seas together on a single boat — that the storm is coming and may drown us together. The exploitive competition between us driven by unfettered egoism that characterizes the human race, prevents us from feeling that we are one big family. However, nature does not recognize international boundaries, does not distinguish between rich and poor, and does not skip anyone. Nature shows us how vulnerable we all are. Ultimately, nature’s system will force us to recognize our interdependence and achieve balance in human society. Whether we learn it the hard way or the easy way, we will come to see that we’re all one and there’s no difference between Indonesian and American, between European and African, between developed and third world countries. We live together on a single planet, and in the eyes of nature, we are all equal. No one is more important than the other. Rather than ignoring this reality until it hits us in our face, we can consciously raise ourselves to a higher level of human connection through education and practice. When we begin to do so, our concern for all of humanity will grow and expand, we will naturally find the ways to build a safe, beautiful and good life for everyone on the planet.